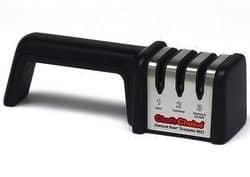 As one of the few manual knife sharpeners on our top 10 list, the Chef’s Choice M4623 comes highly recommended if you prefer to sharpen your knives manually, and are after a budget model. This is more than affordable 3-stage sharpener can basically handle any type of knife. 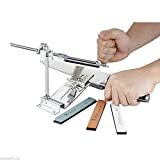 Engineered to restore knifes at both a 20 degree angle as well as 15 degrees, you will be able to sharpen European, American and Asian style knifes in one simple product. Not content with offering this level of versatility, Chef’s Choice have also built the M4623 to accommodate sports, pocket and serrated knives. 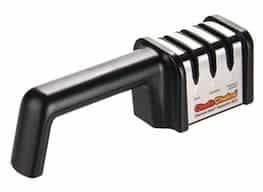 At the current price point it is tough to find a manual knife sharpener with this level of functionality. Like all good sharpeners there is a separate honing stage, that with proper use, will ensure your knifes stay sharper for longer. Chef’s Choice have not scrimped on the materials either – all 3 stages using 100 percent diamond abrasives. 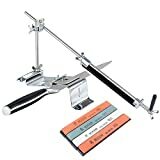 With each stage using patented guiding mechanisms to assist you in precision sharpening or honing, the unit is very easy to use no matter how much experience you have had with manual sharpeners in the past. Also, the unit will stay fast to your worktop. The durable design has a large handle suitable for both left and right handed use, and also has slip resistant rubber feet hold fast to the work surface, while you sharpen. If you are keen to buy a manual sharpener and are on a budget, the M4623 is the right sharpener for you. It has great functionality and a quality build level that will give you adequate results every time.